Last June, my aunt and I went on a trip to Hong Kong. We flew from Butuan to Manila on June 12. Our flight to Hong Kong was on June 13 around 8AM. We have the afternoon of June 12 to spare. What better way to spend than to visit Luneta. It was Independence day after all. 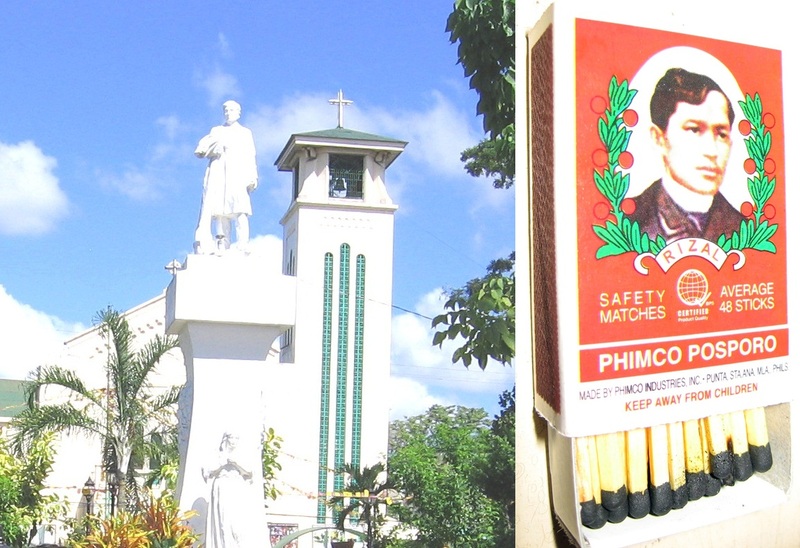 Luneta is the park in Manila where a monument of the Philippine's national hero, Jose Rizal, stands. 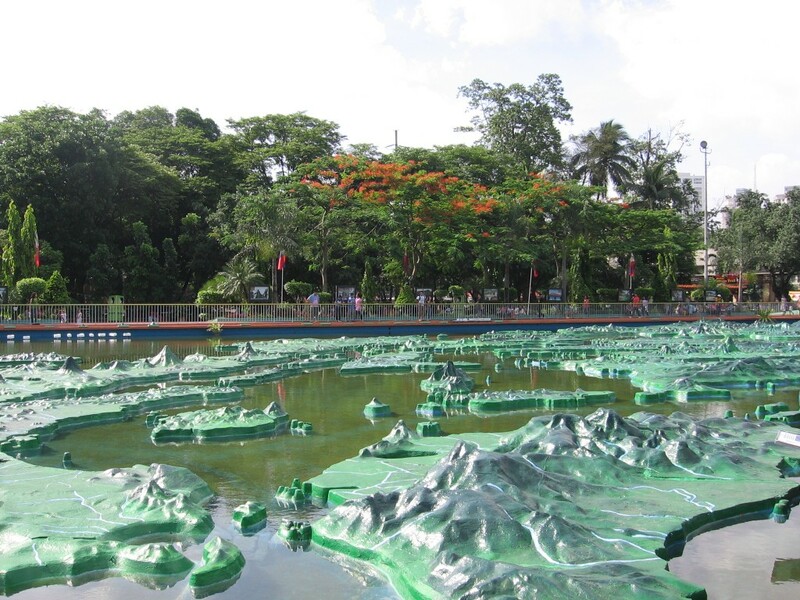 Almost every town in the Philippines has a Rizal park. Luneta is the mother of all Rizal parks. 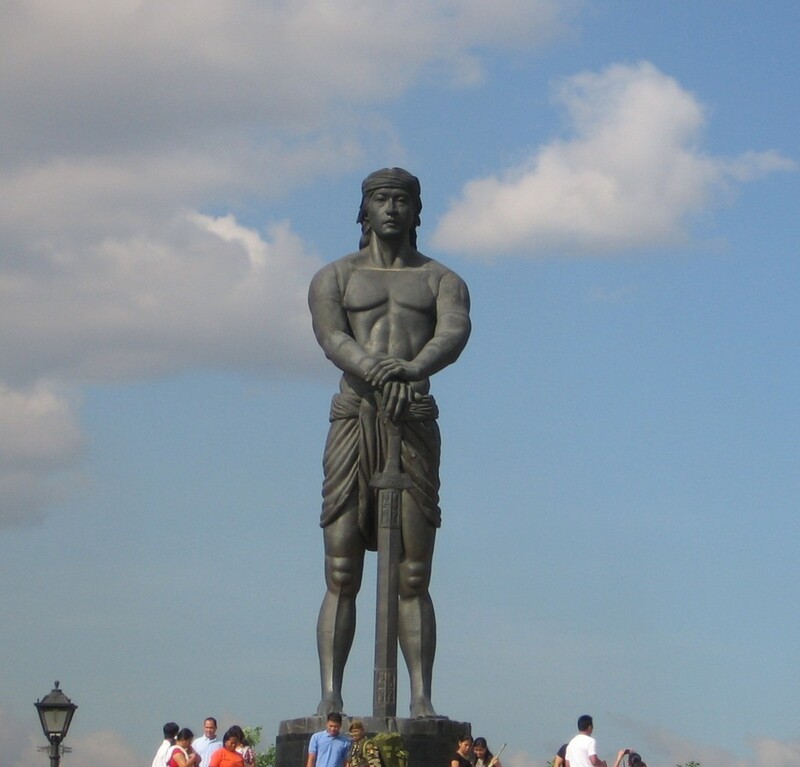 Luneta was formerly known as Bagumbayan. It is where Jose Rizal was executed by the Spaniards through firing squad. Because our flight is on 8am the next day, I already told my aunt beforehand that we are going to sleep at the airport. She needed no convincing because my cousin’s house is in Fairview and my aunt knew how far is that place from NAIA Terminal 3. While I was planning for the trip, my only problem is where to leave of our luggage. I can carry my backpack but I do not think my 65-year-old aunt would want to carry her bag while we stroll Luneta. Good thing I came across an article about Luggage & More. It is a luggage storage facility in NAIA terminal 3. 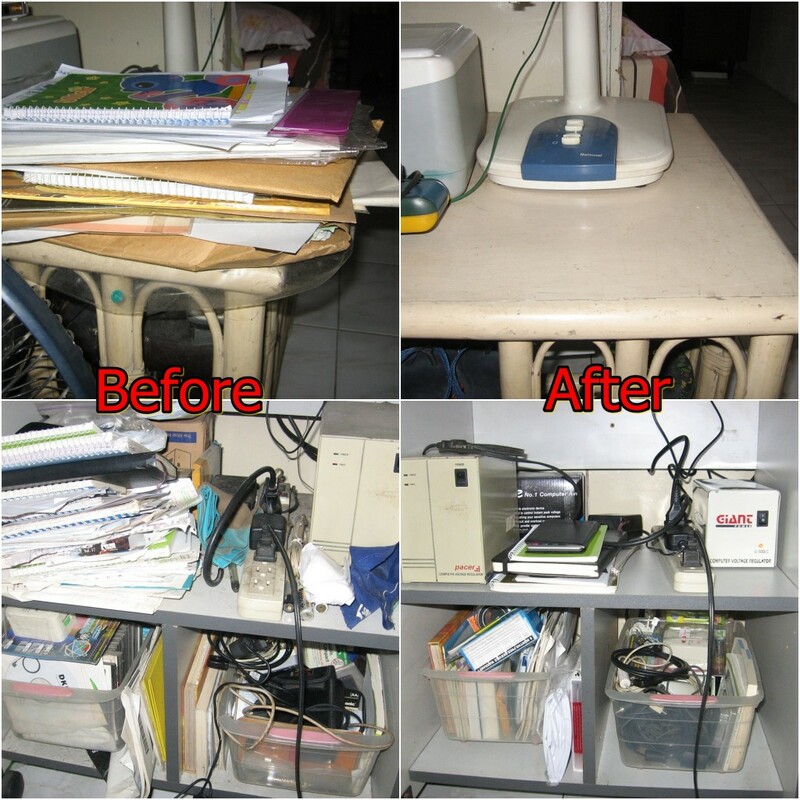 For P150, you can leave your small bag for 3 hours; P300 for more than 3 hours up to a day. Large bags have different rates . The facility is tucked in the right wing of the arrival area. Ask an airport personnel for directions. Luggage & More opens at 6am and closes at 11pm. If you have a plane to catch early in the morning and you leave your bags there, make sure to pick them up before they close. The commuter in me already search the cheapest way to reach Luneta. The airport taxi’s flag down rate is P70. So, that was not an option for the budget travelers like us. Good thing there is the NAIA Loop. It plies from NAIA3 to Pasay Rotunda for P20 per person. Waiting time is longer though. I think we stood in line for 30 minutes. My aunt had some crackers and candies so the wait did not seem long. Besides, we were busy chatting. It was a short trip to Pasay Rotunda. All I knew was that we passed Baclaran area. NAIA loop dropped us at the terminal near Taft MRT station. There is a McDonald’s and Chowking in that area so we picked the latter for lunch. I already researched beforehand the nearest LRT station to Luneta which is the UN Ave station. I already checked google maps and saw that I only need to cross a few streets to get to Luneta. The Taft MRT station connects to the LRT station. We just had to follow the signs. The fare was P15 per person. When added, our fare from NAIA3 to Luneta was P70 -a steal considering the flag down rate for an airport taxi was P70. I am giving myself a virtual pat on the back. One probinsiyana (from the province) booboo though: A man standing beside me on the LRT asked me for direction. Uh-oh. I was not prepared how to react. I knew he was from the province like me. He spoke to me in Tagalog with a hint of Bisaya (like me!). Plus, he was carrying a luggage. He asked, while we were approaching the Gil Puyat Station, “Dito ba Buendia?” (Is this Buendia?) . I stared at my ticket. There is no Buendia in the route. So I answered, “Gil Puyat, po“. The man did not get off on that station but he quickly realized his mistake and hurriedly left the train when we reach the next station- before I can say sorry. I should have said, “I don’t know” so he can ask other passengers. Gil Puyat Avenue is formerly named Buendia Avenue. Oops. The map was right. Luneta was a few steps away from the LRT station. Since it was Independence Day and a Sunday, there were a lot of people in the park. I see families spreading a mat and having a picnic in the park. Mental note: I should do that one in my lifetime. The Armed Forces of the Philippines showed their wares (hehe power?). I saw people posing for a picture holding some kind of weapon. 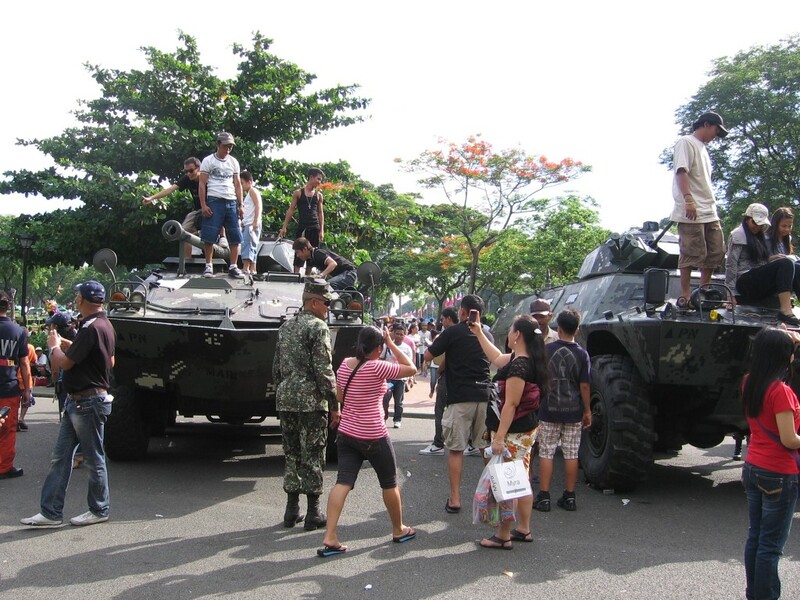 There were long lines of kids waiting for their free ride in an armored personnel carrier. Cameras clicked on people in different poses in different areas of the military tank. Some posed with the soldiers. If not for the number of people, I would have had my picture taken there, too. 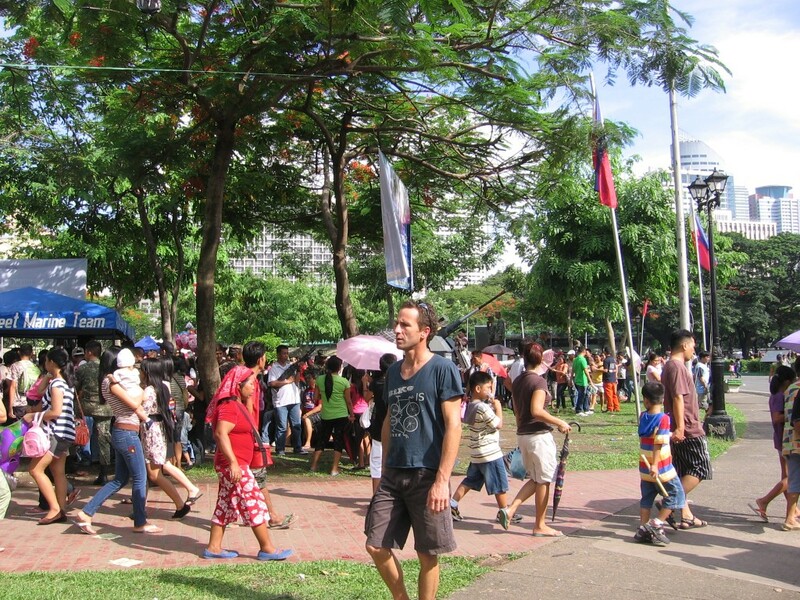 What to see in Luneta? 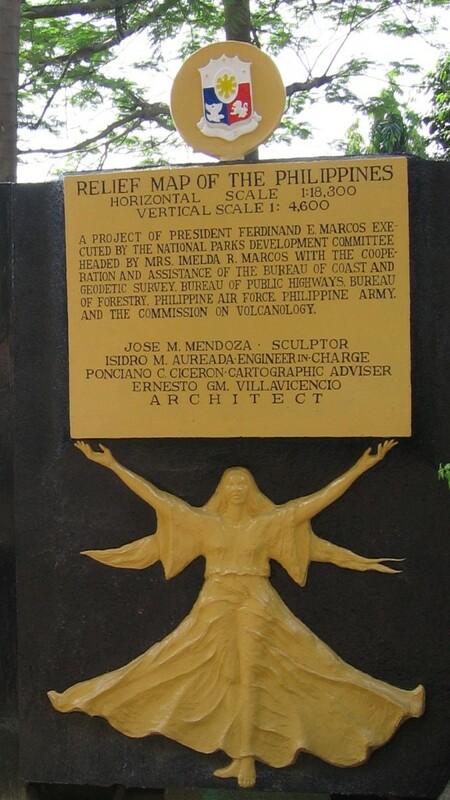 There is the relief map of the Philippines commissioned by Ferdinand Marcos. I was trying to locate Mindanao. It is somewhere there. There are beautiful, old buildings near the park. The National Museum is near the park. 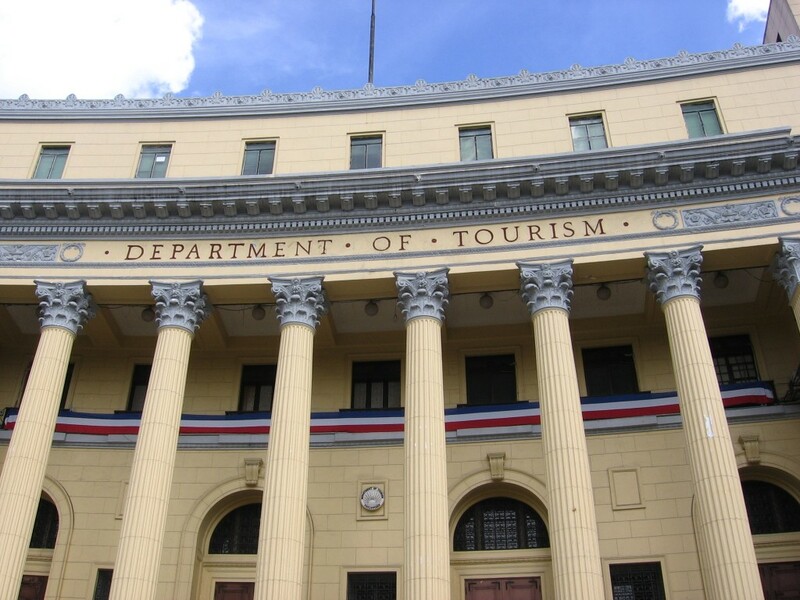 This is the Department of Tourism Building. The highlight of being in Luneta is to visit the Rizal Monument. FAIL! My senior citizen companion got tired of all the walking. The weather was warm and sunny. It would have been a perfect time for strolling. There are trees for shade. I even wanted to go Intramuros. As we walked towards the road that will lead to Intramuros, my aunt hesitated. The roads were empty and she was afraid we will get mugged or something. I was telling her, ” Why should we be afraid? This is the Philippines. Our country. You should be afraid tomorrow. We’re going to Hong Kong.” It has been my wish to visit Intramuros but my travel companions before were not as thrilled as I was in visiting there. Neither was my aunt. Hmp! Maybe I should start traveling alone. Not yet Rizal, not yet. I will visit you one day. Because of the heat, my aunt wanted to go the nearest mall. After a train and a jeepney ride, we arrived at the Mall of Asia. I told her we should watch a movie. We checked what is showing and none caught her fancy. I wanted to try any 3-D movie but she doesn’t. So, we just roam around the mall and passed by an open area. I was curious so we checked it out. 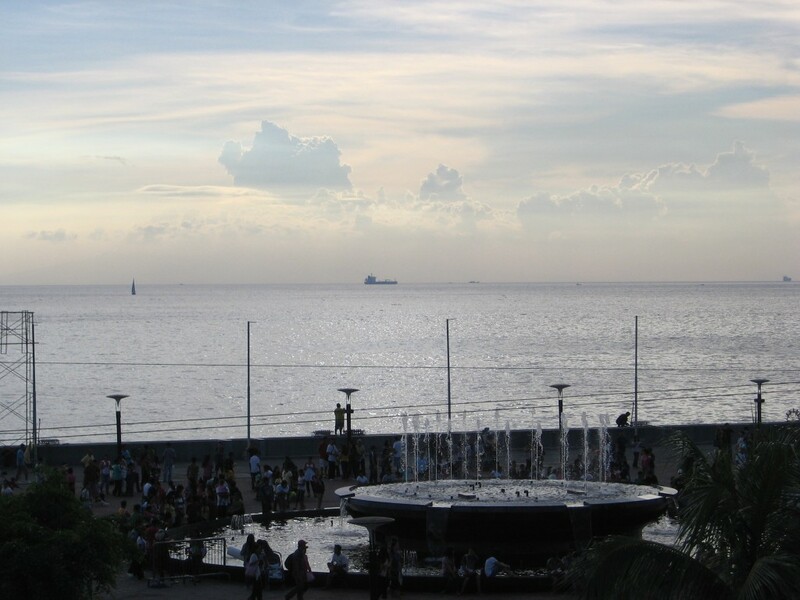 It is the Manila bay! I was thinking, “This is a good time to experience the sunset!” I wanted to wait for it but my aunt was too tired and wanted to sit down. She wanted to be in an air-conditioned area. We were sitting on a bench where people gathered. My aunt dozed off while I watched people go about their business. There was Filipino music in the background so I sang along to the ones I knew. When she woke up, we decide to find a place to eat. 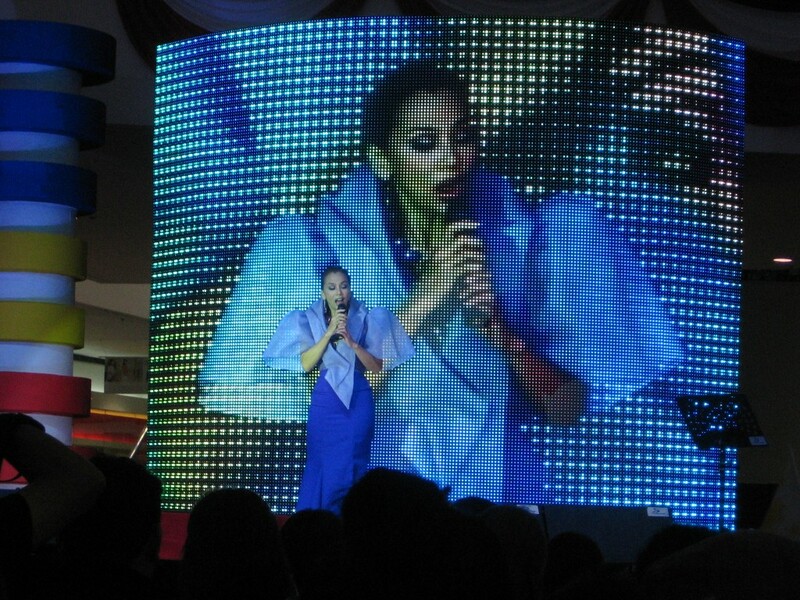 As we went near to an entertainment area where the music came from, we found out there was a free concert featuring Kuh Ledesma. We looked for a good vantage point and enjoyed the free concert. Henry Sy was there. He was on his wheelchair looking down from the second floor. I did not see his face but I saw the wheelchair as Kuh acknowledged his presence. It did not look like he had many bodyguards. He was watching like regular people. After we had dinner at Jollibee (Filipino fastfood chain for Independence day), we rode the jeep to the MRT station. I made a mistake of using the pedestrian walkway instead of the LRT station to cross the busy EDSA traffic. It was scary. We were on this metal platform traversing over a very busy highway (EDSA). We could see vehicles in moving fast underneath us. I could feel the walkway vibrating as I took a step. I kept praying that the walkway will not collapse. Thankfully, we reached the NAIA Loop station in one piece. Another booboo: I thought the drop off point of the bus in the airport is the same place where we took the bus. While quite a number of people got off in the middle of the arrival area where the bus stopped, we stayed on our seats thinking we should stop near the area where we took our exit because the Luggage&More is near that area. There would be less walking for the senior citizen. I saw the confused look of the driver when I asked to be dropped there. As we reach the door where we exited, I realized my mistake. There is only one entrance. The door we used to exit was for exit only. We walked (long walk) again towards the only entrance (where the bus stopped first). We gathered our luggage and found a good spot were we could spend the night. I thought sleeping at the airport was my novel idea. Nope, there were a lot of people who found a good spot for themselves. A lot of them were sleeping soundly already. 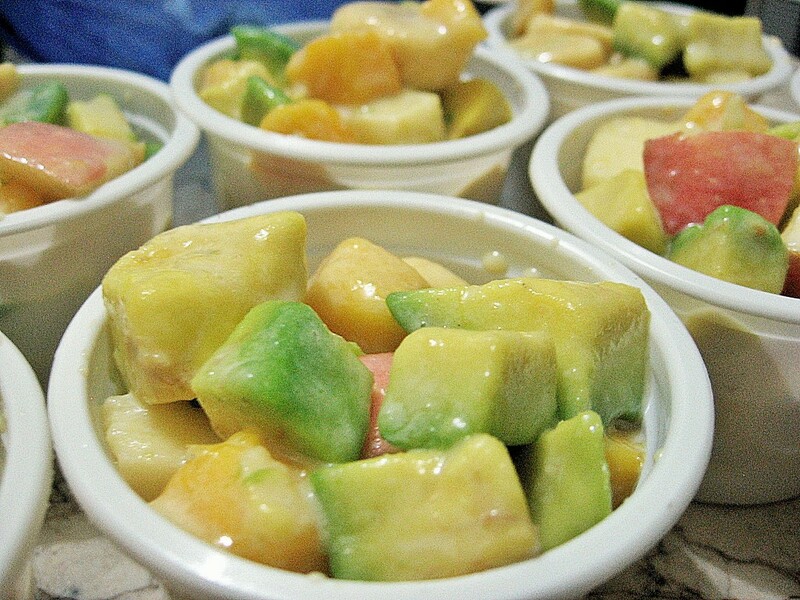 Fruit salad is a favorite dish in the house. Simple, healthy and delicious. We use fresh fruits in our fruit salad plus evaporated milk and sugar. There is no exact recipe. We just use fruits available in the market. 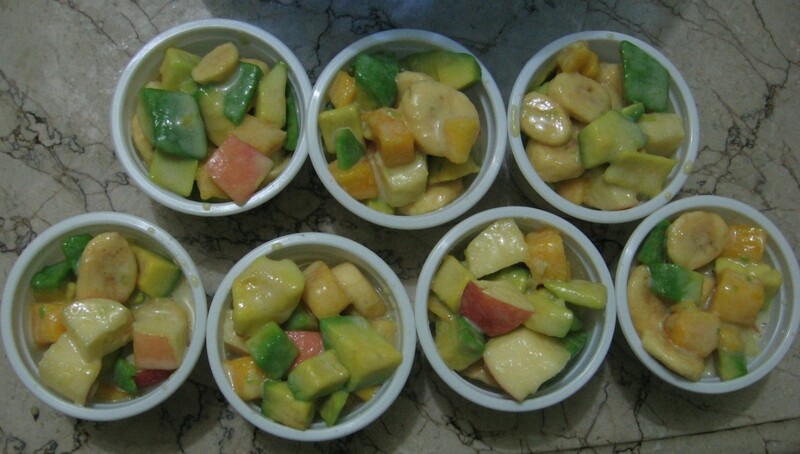 Our fruit salad is usually a combination of any of these fruits- papaya, mango, apple, banana and avocado. Yes, avocado is a fruit in my country. It is an ingredient in dessert recipes. We have avocado ice cream and avocado shake. On avocado: My father used to tell me that the nutritional content of the avocado is equivalent to 8 eggs. He told me that my mother who is hypertensive should avoid eating avocado. We used to believe that until we heard that the avocado helps increase the good cholesterol which will fight the bad cholesterol. If we want a fancier fruit salad, we add raisins and marshmallows and use condensed milk+cream instead of the evaporated milk+sugar combination. It is only recently that I like eating fruit salad. I used to dislike eating anything mixed. I used to be a purist. I eat the fruits but when they are not combined with other fruits. Before, when I eat fruit salad, I eat all the papayas first, then the avocado, and so on. The preparation of the fruit salad is my task in the kitchen. I like cutting the fruits into bite-size pieces. I feel like a chef because I can cut them with ease due to their soft flesh. The simple procedure ( cut+dump in bowl+add milk and sugar+mix a little+refrigerate) has become second-nature to me. Foolproof! On a regular day, there are 5 of us who share the fruit salad. We usually make just enough for one meal. Because we all like fruit salad, we tend to overeat. Some more voracious than others. The slow-eaters are at a disadvantage. We figured we must portion out the salad instead of just putting one large bowl. Thus, we have these. If there are leftovers, we freeze them and we got ice cream the next day! Yum! Truth be told, my tummy is still heavy with the salad I ate for dinner. Therefore, I am still awake because sleeping with a full stomach is not advisable. Afraid of bangungot. Bangugot, according to my nurse relatives, is acute hemorrhagic pancreatitis. From what I gather from them, it happens when the body is on sleep-mode while the stomach continues its work in digesting the food. Before I end up in nightmares, I end the day with this prayer. Angel of God, my Guardian dear, to whom His love commits me here, ever this day (or night) be at my side, to light and guard, to rule and guide. Amen. Being an only child, the closest I get to having a niece or a nephew is through my first cousins. Although I have nieces and nephews from my father’s side of the family, I did not grow up with them. I have met 3 or 4 of them but it did not feel like I was an aunt. They live far away from me. The first week of July this year, we welcomed a new baby in the family (mother’s side). 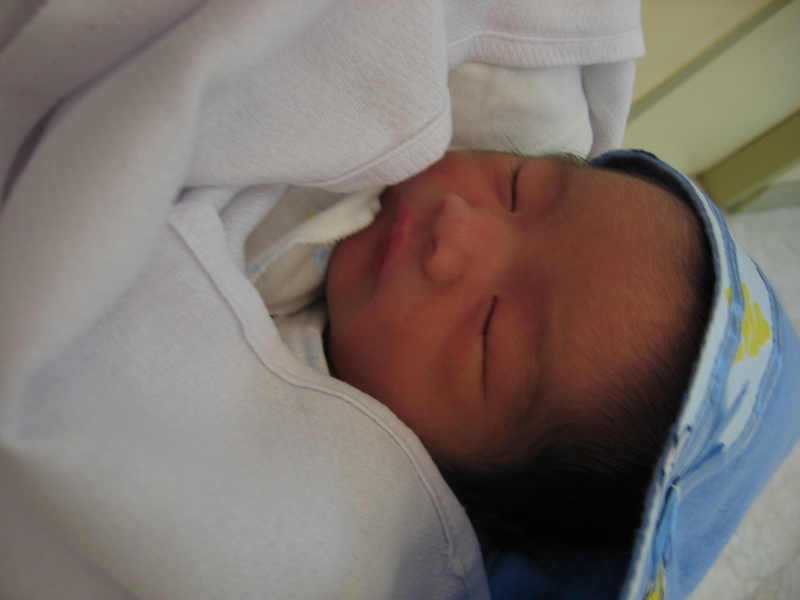 My cousin is the father of this cute little boy. It is amazing how one little boy can make a grown man cry with joy. Yeah, my cousin is one proud daddy and I am a proud aunt. The sight of the baby sleeping is calming. I can stare at this all day. I tried carrying him but I worry that I might squish him or drop him. I have held a baby only a few times in my life so there is that fear that I was not doing it right. I do not think I can babysit for this kid. I’ll just wait for him to grow up and I’ll be his playmate. Hopefully, I will be the cool aunt- the one with all the candies and junk food. Hey, it is not my role to discipline. I am not the parent. I do not think my cousin is reading this blog so I am safe to declare this things. I pray that this kid will grow up to be a fine young man. Below is a favorite poem of mine by Rudyard Kipling. It says everything I want to say to the little boy when grows up. Fair warning: This is not a self-help guide on computer repair. The blogger is just narrating about the alternative activities she got involved in without using her Internet connection. I confess. I am online almost 16 hours a day. (Gasp!) I wish I am one of those people pounding the keyboard doing codes to create innovative websites. Embarrassingly, I am usually on Facebook and Twitter. I use Facebook to get in touch with friends and Twitter to promote my articles. This year, I have been to the computer shop twice already: the motherboard and power supply were replaced. Last year, the hard disk was replaced and RAM was upgraded. When the computer conked out the third time this year, I decided it is time to get a new one. I am glad to learn that the new system will cost me Php 7,000 cheaper than the amount it cost me to buy the old computer six years ago. I can not see myself buying a laptop because with the same specifications as the new desktop I am eying, it will cost me Php 10,000 more. As much as I like the mobility in having a laptop, it is more of a ‘want’ than a ‘need’. Besides, I am not that mobile. I like working with a normal keyboard. With the computer under repair and the new one still being configured, what should I do with the free time? Stacks of paper have accumulated in the room. Old CDs are still kept even if I do not use them anymore. I do not even know what is in them. While the room looks in order and neat. Dust had settled in the nooks and crannies. Since I am buying a new desktop, I might as well clear all the clutter and start anew. So, the cleaning begins. The Hunger Games is a trilogy by Suzanne Collins. A copy was saved in my phone. IBecause of the free time I have, I was able to finish it. All I can say is that I LOVE the story. The trouble with finishing the book is that I want to continue with the next book which is still in my computer that was under repair. Today I found out that it is going to be a movie next year. I hope it is gonna be a good adaptation. GO and read this book! Visit the official website and download some excerpts here to see if this book catches your fancy. Lately, I have been listening to The Script, Adele, Train and Katy Perry. But alas! I have not loaded the music files into my cellphone so I have to be contented with what I have previously loaded. I checked my cellphone and I saw that I still have Lea Salonga, One Republic and Wicked cast recording on my track list. Not bad. In the middle of the night, I put my headphones on and listened to the soothing voice of Lea Salonga. This is not one of my favorite chores to do. But I got ‘new’ clothes from the thrift shop that need to be thoroughly washed. (Read: Ukay) My hands got some beating after all the wringing I did. Although my fingers looked tired and sinewy, it looked beautiful. (Like they say, “Beautiful hands are hands that work.” 😉 ) I went to sleep with a feeling of accomplishment. One of my favorite things to do though is folding laundry. I find comfort in the smell of fresh laundry. Smoothing the fabric and folding it is zen-like. I like seeing neatly piled clothes. Maybe I should get a job in a clothing store. I am relieved to know that I am not that dependent on technology. I still can enjoy my day without my computer. I knew this last year when we had scheduled brownouts for two months. Every afternoon, I spent it looking through old photos, reading magazines and listening to music. I found a nice spot where there was natural light. 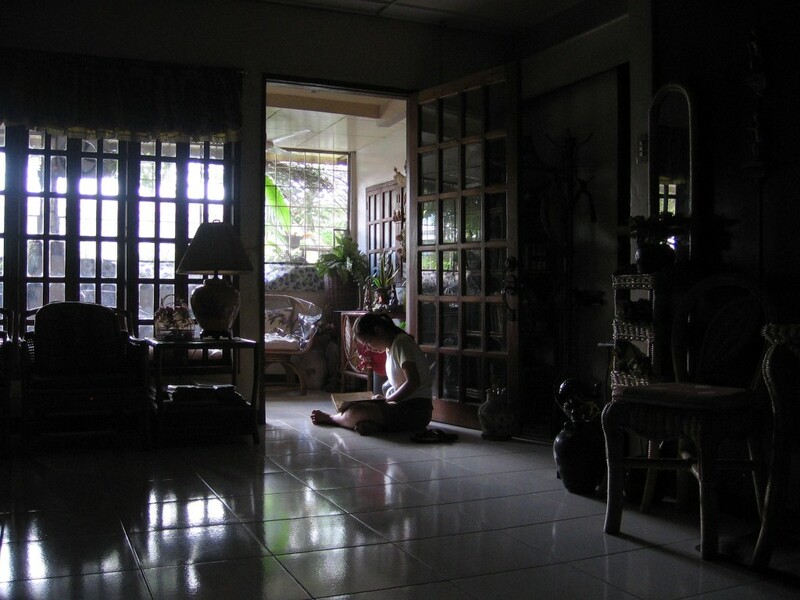 While some of my cousins ranted about boredom, I was perfectly contented where I was. 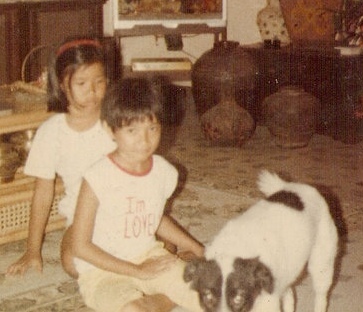 The last time the house had a dog was when I was still in grade school. His name was ‘Bagets’. If you are not familiar with the ’80’s Philippine pop culture, Bagets is a coming-of-age movie which stars Aga Muhlach, Herbert Bautista, to name a few. I was afraid of the dog. (I am afraid of dogs. Period.) 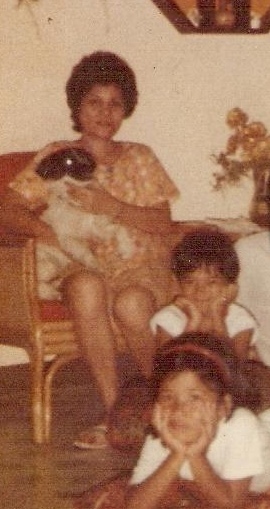 Being the new face in the house then, Bagets would go near me which frightened me. I was so afraid to go near the dog that they let him out of the house just to stop me from crying. But when it was time to let him in, they could not find him. He strayed to some house a block away from the house. Even my grandfather looked for him. Good thing they found him. I realized that I should try not to panic around Bagets because I saw how worried everyone was when he got lost. It is evident in this photo that I was afraid of him. Bagets tried to ignore me. Thus, he was almost cropped out of the photo. I was the little girl at the back who was afraid of Bagets. Since I was often visiting my aunt’s house, Bagets and I became friends. When we moved to this house, Bagets treated me the same way he treated other members of the household. He would bark and run about when I return home from school. When my cousin and I would ride the tricycle to go somewhere, he would run after the tricycle wanting to go with us. We sometimes feared he might not be able to find his way home because he would run after the tricycle as far as he can. When he got into a fight with another dog, my cousin and I cried over his wounded leg. When there was a fire a block away from us and we were packing our things, my cousin and I cried thinking that we will leave behind Bagets. Bagets died when I was already in high school. I was not home so I did not see him die. I still miss him. He was a good dog. Bagets died in the early ’90s. 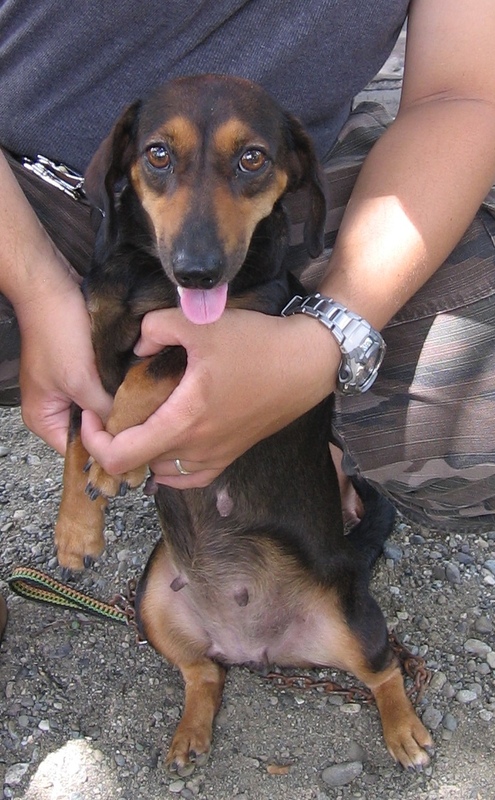 We did not have a dog until my cousin brought ‘Shawie’ home in 2008 ( Or was it 2009?). She is a dachshund. Now, my aunt has a new puppy and I get to play with him everyday. I am the big sister to the puppy, so to speak. (There are no more objections from my father because he is already in heaven.) The puppy was named Joaqui. 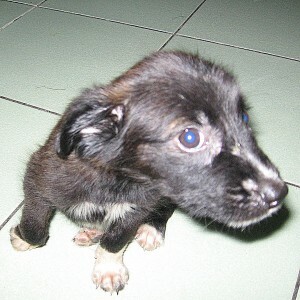 I hope he is a good dog like Bagets. He is still small and the entire house is his playground. He quite behaved. Although he is still not toilet-trained, he would find a corner to hide in shame whenever we shout his name because he pooped in the house. It is so easy to forgive his toilet mishaps when he looks at us with his doe-eyes. I think he is going to be a sweet, sweet dog. I just hope we will be able to raise him well so he can live a long life.